"Listen to your music whenever and where ever you want using Deezer!" There are a lot of choices out there these days when it comes to streaming services allowing you to listen to a virtually unlimited library of music just as long as you are connected to the Internet. These services are usually paid per month, which then allows you access to the library as if you own all of the music. You can listen to any song you want, start to end, and listen to your favorite part of the music over and over again. Deezer is one of these many services, but with its extensive collection, beautiful user interface, and easy usability - Deezer completely stands out from the rest in regards to keeping the listener happy. Listen to your favorite music in playlists, a collection of albums, or just a collection of your favorite single on any of your devices. 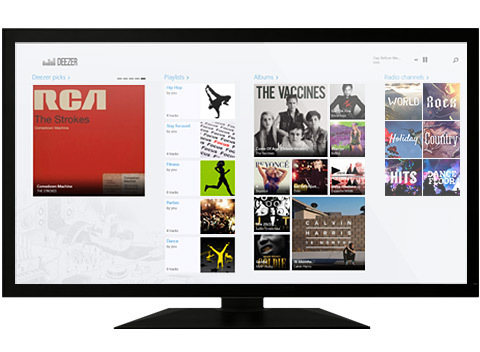 A tablet, phone, or your computer - Deezer is there for you when you want to listen to your favorite music. the service also allows you to use a randomized radio feature, which is something people have gotten used to seeing with service such as Pandora. You get a little bit of everything with Deezer, and rather than having only one choice of how you can listen to music; you get several and can listen to your music your way. Deezer player also allows you to view the lyrics of the online music you are currently listening to. Not just that, but it will actually highlight the line of the lyrics that are currently being spoken in the song as it is being sung. That's pretty awesome, and something that other services usually do not have without additional addons - or simply requiring you to access the Internet to access such content. It's all with in one application when you use Deezer. Love music? Deezer for PC has definitely got your type of taste in mind. Give it a tryand get this Deezer download!